It is 1940 and the vapour trails high in the summer sky tell the story of the battle that was to be the RAF's finest hour. 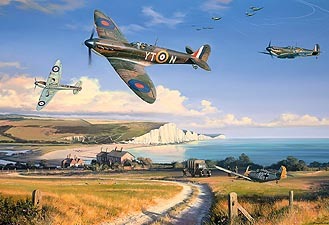 Against the backdrop of the white cliffs of Dover, Spitfires from 65 squadron head home to re-arm, whilst a squadron of Hurricanes climbs out to intercept a further wave of invaders. Puzzle size 49cm x 34cm.